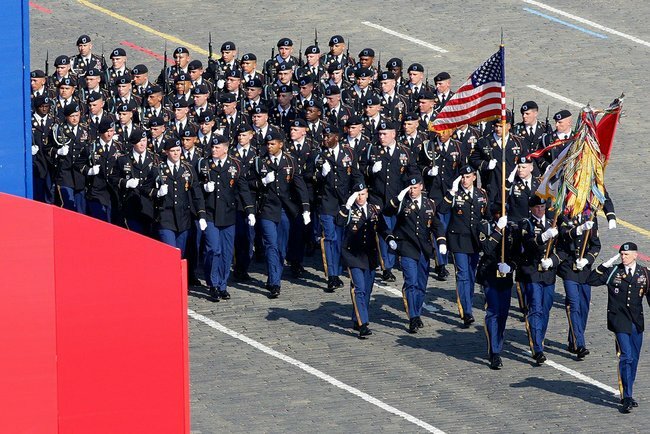 C Company, 2nd Battalion, 18th Infantry Regiment marches in the Victory Day Parade in Red Square for the first time. Saturday marked the 65th anniversary of V-E Day in most of Europe, but for Russia – being several time zones removed – Sunday, May 9th was V-E Day. Throughout the Soviet era, a yearly military parade was held in Red Square to commemorate victory in the Great Patriotic War, but after the Soviet Union’s dissolution these parades were reduced in scope and grandeur. Vladimir Putin restored the Victory Day Parade to its former prominence in 2008, and this year’s parade was possibly the most epic yet. For the first time, Allied and CIS forces also marched in the parade – an American company from the 18th Infantry Regiment, a British company from the Welsh Guards, a Polish battalion, a French aviation detachment, and troops from nine other countries – commemorating the global effort it took to rid the world of Hitler and Nazism. 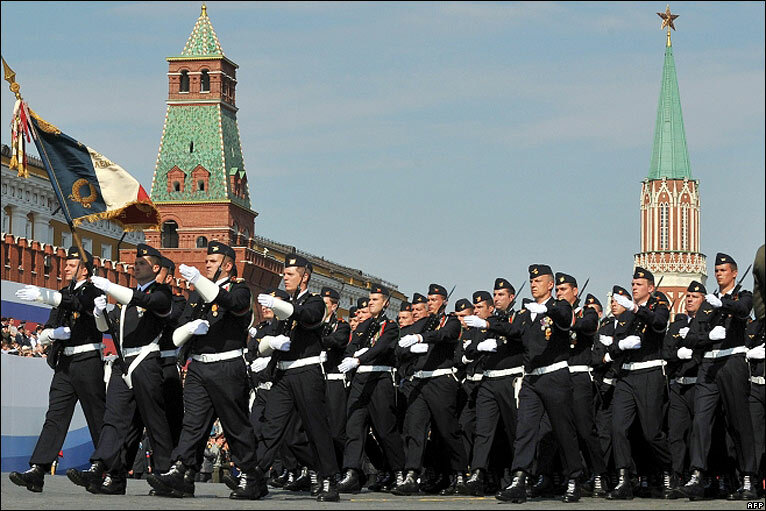 French troops march in the Victory Day Parade in Red Square. “This parade unites all those who participated in the war,” said Iosif Efron, 85, who recalled that his Soviet division encountered American forces at the Elbe River in Germany at the end of World War II. “The invitation was absolutely proper. We fought together, and they helped us. “Of course, without Russia, no one would have defeated Germany,” he added. There are a ton of stunning (and not a little bit intimidating) photographs of the parade at Wiki Commons – including a real, live T-34! – and the BBC.